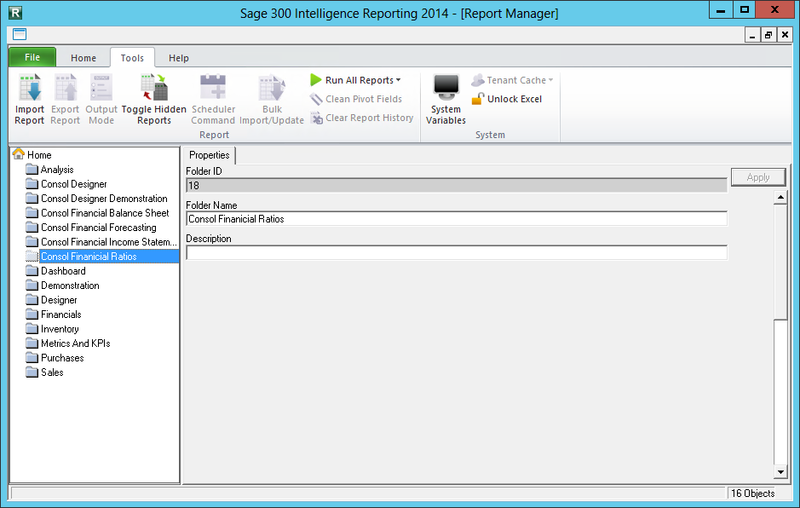 With our upcoming Sage 300 ERP 2014 version we will be integrated with Sage Intelligence Reporting 7.4. Within our product this will also be labeled as version 2014. This is a fairly major upgrade to the Sage Intelligence package and definitely worth a look. There have been a great many feature, usability and performance enhancements throughout the product. This product is integrated to many sister Sage ERP packages and this is where Sage is investing in improving Excel based reporting. For ERP a big usage of this is for Financial Reporting, but don’t forget this is a useful tools for many other applications like Sales Analysis. Many of our Sage sister products used Microsoft FRX as their financial reporter. This product has now been discontinued by Microsoft. To provide a replacement we spent quite a bit of time adding features contained in FRX into Sage Intelligence. Sage 300 never used FRX, but we now benefit from all this work with better Financial Reporting from Sage Intelligence. For Sage 300 ERP installed on-premise, it still includes the Financial Reporter bundled with General Ledger. This F/R is still there and supported. We just added support for Excel 2013 which was a major job due to the changes in Excel from a multiple document interface (MDI) to a single document interface (SDI) along with Excel now having data execution protection (DEP) turned on. We understand that people have invested a lot in developing many powerful reports with this technology and are quite happy with how it works. For the Sage 300 Online product we have removed this Financial Reporter and are only hosting Sage Intelligence for Financial Reporting. With this cloud offering we are looking to the future. 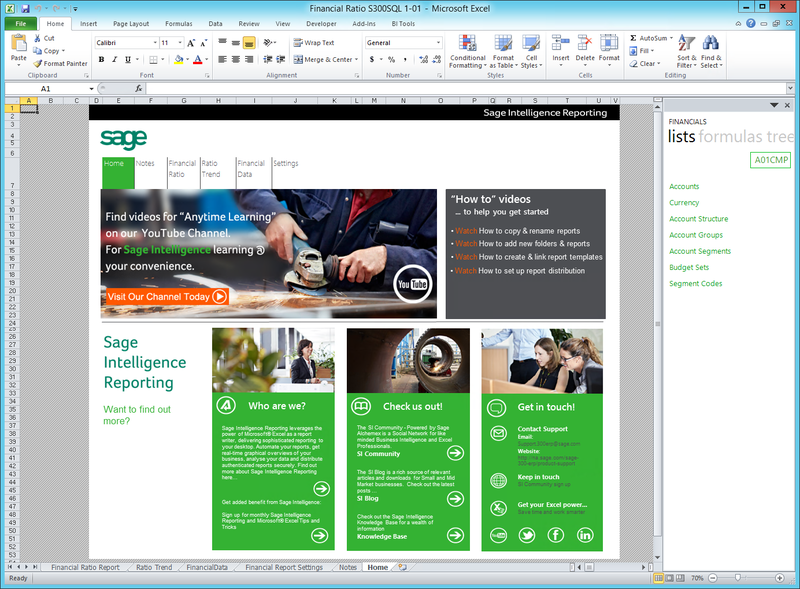 With version 1.0 of this product we are running the regular desktop version of Excel to work with Sage Intelligence. But this isn’t really what we wanted. As a cloud offering we wanted to integrate to the cloud version of Excel, namely the browser based Excel 365 version. However the API for this product isn’t sufficient yet to do sophisticated Financial Reporting. Once Excel 365 develops sufficient power, we will be integrating Sage Intelligence to this and allow cloud based use of Office 365. By using Sage Intelligence it means that when we switch from the local installation of Excel to using the cloud version, all your report will continue to work and won’t need to be re-written. 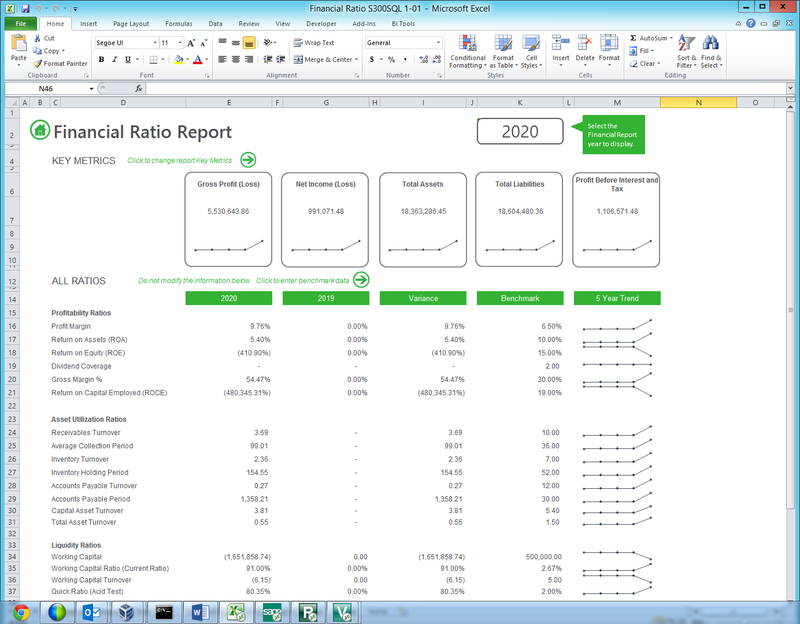 For the Sage 300 built-in Financial Reporter it will only continue to work with the local installed version of Excel. As a result of this besides adding features needed for FRX users, we have also added functionality to Sage Intelligence to make it more comparable to the built in Financial Reporter. We now load all the data into memory at the beginning and then do all reporting from this in-memory database. 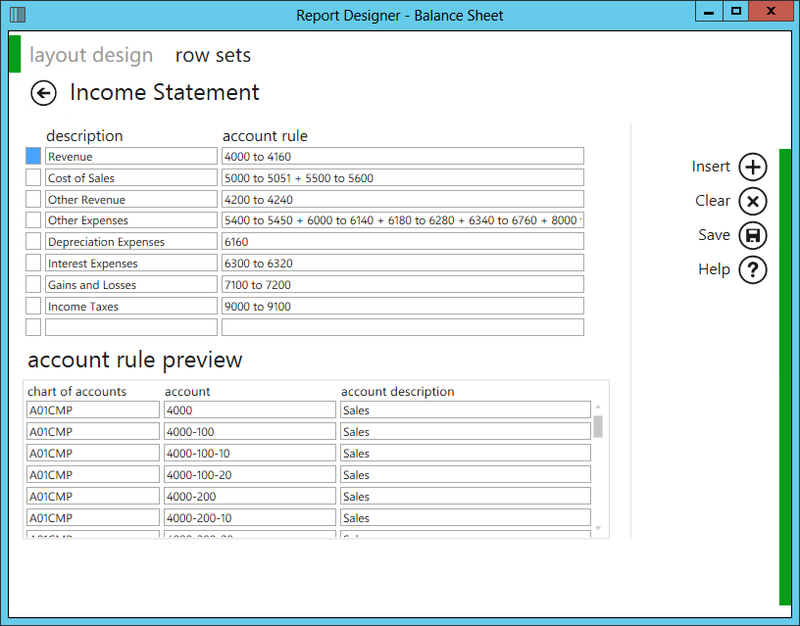 This way as you change reporting options and interact with the report, you get far better performance than before. No more re-reading things from the database as you go along. 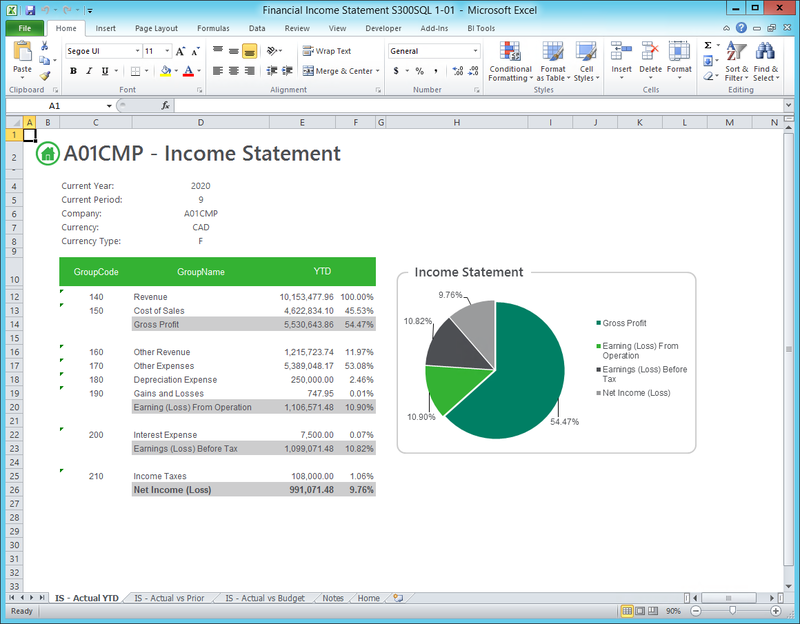 Sage Intelligence 7.4 now supports running Excel 2013 both 32 and 64 bits. 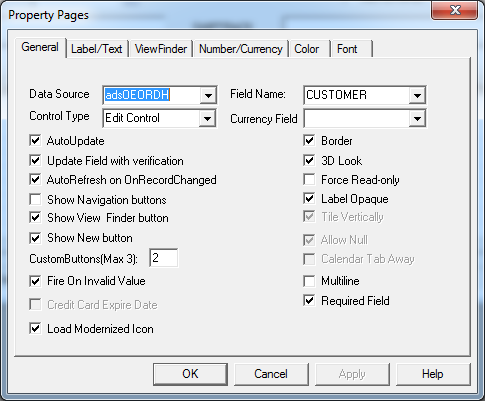 For Sage 300 ERP the built-in F/R supports Excel 2013 but only running in 32 bit. If you absolutely need 64 Bits then give this solution a look. However MS does install 32 bits by default now for Excel 2013 due to all the compatibility problems with the 64 bit version (it isn’t only us). Similarly Sage Intelligence also no uses .Net framework 4 which is better supported and avoids installing old versions of the .Net runtime. Let’s look at a few of the new things in the product. First we’ve modernize the toolbar in the Report Manager to the Office ribbon style. We’ve also fixed up the wording and hints to make this a bit easier to use. And then the actual report. Note that there are a few more ratios here than in the built-in report along with graphs and such. For the Balance Statement and Income Statement reports each three are incorporated into one Sage Intelligence report, each on a separate tab. One of the income statements is shown below. Sage 300 ERP 2014 will be bundled with Sage Intelligence 2014 which is version Sage Alchemex Intelligence 7.4. This is a fairly major release which greatly increases the power of Sage Intelligence as a Financial Reporter. It adds many features to be comparable to both FRX and to the built-in F/R from General Ledger. This version supports Excel 2013, including the 64 bit version and this is the product that we will be adding cloud based Excel 365 support to. In a previous posting I talked about some improvements to the look of the Sage 300 ERP Desktop, in this article I’ll be looking at a number of improvements we’ve made in our document entry screens. The last major screen refresh was when we re-wrote our screens from CA-Realizer to VB6 for version 5.0A. This was a major technology upgrade that enabled much of the new technologies in our screens. This allowed them to be customizable and enabled things like screen resizing. Back then we designed the screens for a maximum display resolution of 800×600 and designed the screens accordingly. Since then over several versions we’ve added many new features and this has tended to clutter up the screens. With this version, we aren’t performing a major technology refresh but we are revisiting many of the screen design decisions made back in the 5.0A days and making small but significant changes to make the screens look more modern. We don’t want to disrupt current customers with this release, we want the screens to still be familiar and we want people to work the way they have always worked. As a result we haven’t rearranged fields or moved fields around. Everything should be where you remember it, just laid out a bit better using some extra space. First we’ll look at the new O/E Order Entry Screen so we can refer to it as we go through the various changes. When we released 5.0A 800×600 was a pretty good super-VGA resolution that could be handled by most good laptop and desktop computers. Now it’s pretty easy to get multiple banks of 27 inch monitors with terrific resolution. If you want to spend a lot of money you can even get 4K resolution. However we now live in a world with quite small ultra-notebooks as well as a plethora of tablet computers. So we can’t greatly change our minimum resolution, but we can at least increase it to 1024×768. This then gives us a bit of room to unpack fields, to get better column alignment and to add a bit of white space back to the forms. Some fields where quite squished in, and now we can get back to everything having a bit of room to breathe. This is then much easier on the eyes and makes using the screen a bit easier on the concentration. If you look at the form, you might notice that we’ve updated most of the little bitmaps, for instance, to create a new record or to drill down to further information. Some of the graphics are a little larger than they used to be, taking advantage of the extra screen real estate. They are also a little more modern looking with the current prevailing styles. Notice that everything is a bit flatter looking as this is the trend. We’ve added an asterisk to all the required fields. You can see this on the Order Entry screen next to the Customer Number along with a little legend over on the right. This has been a long time requested feature for the product. Order Entry doesn’t have many required fields, but some other functions have quite a few. These just give you a visual cue of which fields to enter, so you can avoid annoying error messages when you save or post a document. All of these features are “opt-in”. If you don’t do anything to your screens, they will look and behave exactly as before. We don’t want to effect screens generically, since if we just put in the new graphics, they could cause fields on screens to overlap and such. Besides remaining compatible with third parties, we also need to remain compatible with older versions of our applications for before they are activated to the new version. Some of the old graphics are quite small and didn’t want to limit ourselves to those sizes since it restricted the graphics designers too much. Of course resizing the form is up to you and just done in VB. I suspect many ISVs have already adopted larger screen sizes, so this may not be such a big deal. Note the checkboxes for “Load Modernized Icon” and “Required Fields” that have been added to allow you to enable these features. 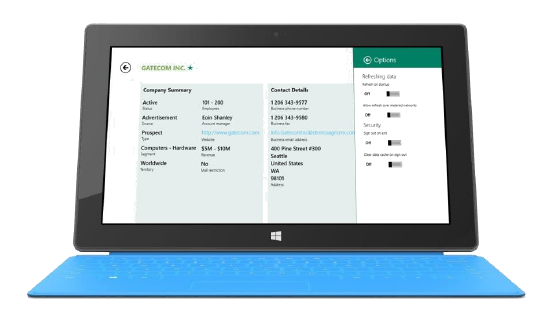 With each release of Sage 300 ERP we are striving to take steps to improve the look and usability of the product. Since the 2014 version isn’t a major technology release we want make sure the changes aren’t disruptive. As a result we’ve analyzed a number of improvements that are useful, but won’t cause any retraining burden on our customers. Combined with the changes to the Desktop, these changes give the product a fresher look. Then we’ll keep on adding a few improvements of this nature in each product update and release. 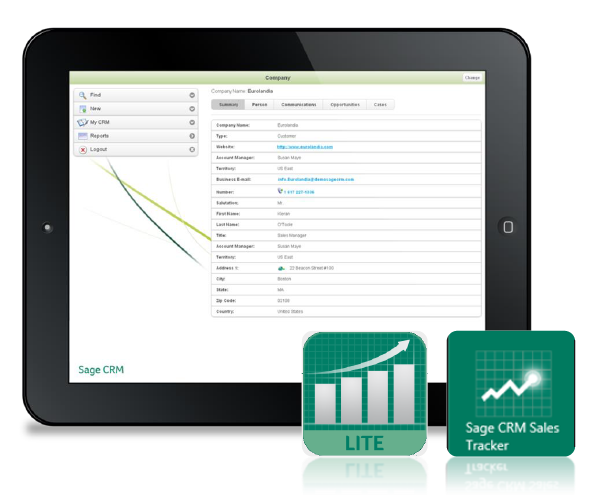 Earlier this year Sage CRM 7.2 was released for standalone CRM customers. We have competed the Sage 300 ERP integration in conjunction with the Service Pack 1 release of Sage CRM 7.2. We have now released the Sage 300 ERP 2012 integration for Sage CRM 7.2 and this is the integration that will be included in the forthcoming Sage 300 ERP 2014 release. Generally customers find that combining Sage CRM as a front office solution to Sage 300 ERP as the back office solution creates a much more powerful combined system than having separate ERP and CRMs. The level of automation, reporting and customer connectedness is greatly increased across the organization. As such introducing a new version of CRM can provide many immediate benefits for companies and this blog is looking at some of the things that are new in this version. We find that customers running both of these Sage products together have much higher net promoter scores than customers running non-integrated systems. Historically CRM programs managed communications with customers and other business contacts by managing e-mails and phone calls. CRM had all the basic contact information, integrations to help automate these processes like creating e-mails and automatically recording the information in CRM. Auto-dialing phones and logging that you called and letting you fill in some comments. Setting reminders and schedules for performing these tasks. However, how we are communicating with our business contacts is changing. Many people are using e-mail and voice phones much less than they used to. I ignore most incoming calls from unknown callers because they are usually cold sales calls or scams (like you have just won a cruise vacation). E-mail is getting much noisier with spam and other junk, causing more important e-mails to just get lost. It’s been found that recent high school graduates actually have quite an aversion to actually talking on a phone and don’t use e-mail much. Now there are many more communication channels. Many people now communicate via various social websites like Facebook, LinkedIn, Google+, Yammer and Twitter. Many calls are made via services like Skype and there are people texting more than ever and even using systems like BBM. So if we want to get a complete comprehensive picture of all our communications with a customer, we need to see all of these in CRM as well. 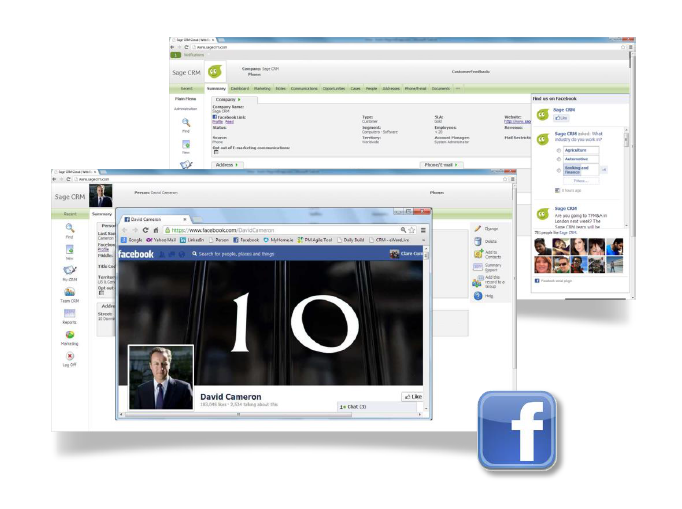 We added LinkedIn and Twitter connectors to Sage CRM last version and with this version we have added Facebook integration. With this Facebook integration you can bring Facebook information right inside Sage CRM to better understand your customer. You can associate Facebook pictures and profiles with prospects. Generally this is an avenue to get a more complete picture of your customer, or potential customer’s business. Getting good leads is usually a big problem for companies. Chances are that for a given customer, his contacts will be related in some way and perhaps offer good prospects to market to. If you do get a response from one of a customer’s contacts then you can use the original customer as a reference to help make the sale, or act as an introduction to get you in the door. Social Media stores terabytes and terabytes of information on business’s and people. Being able to effectively mine all this information is going to be a huge competitive advantage in the future. 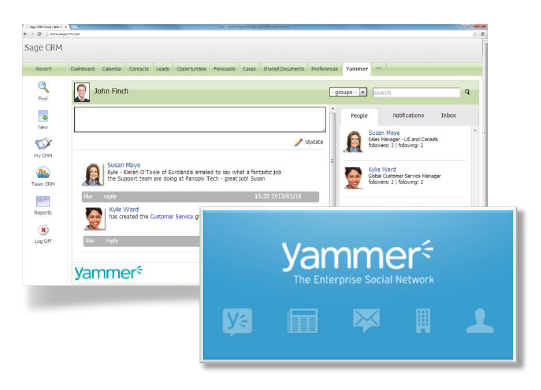 Another social feature added to Sage CRM 7.2 is Yammer integration. Yammer is a social network for collaboration within a company. With this integration your sales teams can collaborate and share information using Yammer from Sage CRM. People don’t necessarily spend their entire day sitting at their desk behind a computer. They work from home, they travel on business trips and visit customers face to face. You CRM system contains tons of useful information that will help you do your job better if accessible in these situations. Over the past couple of versions and further with this new version, we‘ve been adding mobile features to Sage CRM to make it easier to access from mobile devices. Sage CRM is a web application and with the previous version we enhanced to work with all popular browsers. This then allowed mobile users (which usually have Safari or Chrome) to browse the Sage CRM screens. Perhaps this works a bit better for tablets, but tends to be a bit of a pain on an iPhone. 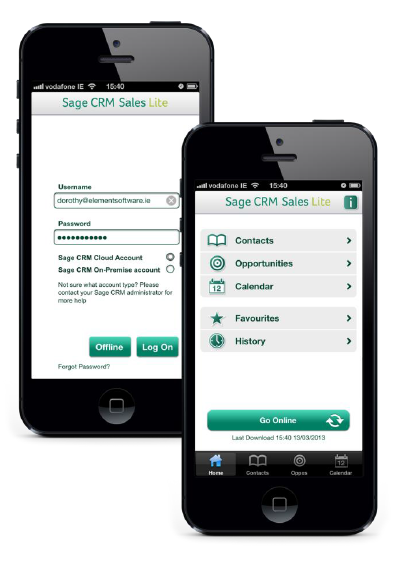 As a result we’ve been adding native device apps to complement the web interface to Sage CRM. Plus we’ve been working on improving the web interface so it will work much better on table devices like the iPad. As we move forwards we will be providing more and more functionality on more and more mobile devices so you can instantly get any information you need instantly. Down the road you might be wearing your Google glasses and when you say the customer’s name, all the information on that customer will be right there in your view to reference. With this version of Sage CRM we’ve improved the reporting capabilities. A new HTML5 based charting library has been added, so you don’t need Adobe Flash for charts anymore. 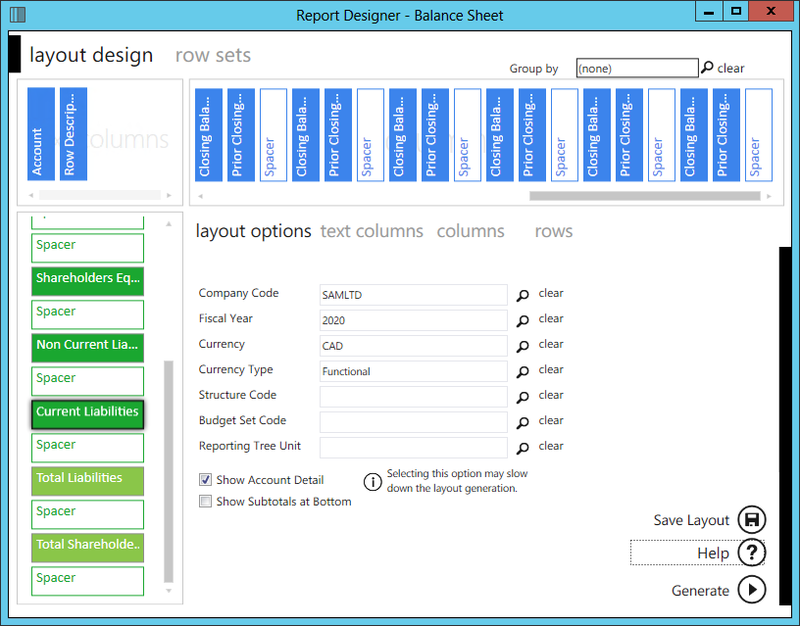 You can clone reports to get started with a customization. There are more chart types with more configurable settings. There are new security settings so you can better control who can see what. Sage CRM 7.2 adds more codeless customization capability where you can design more powerful screens right in the product without writing code. 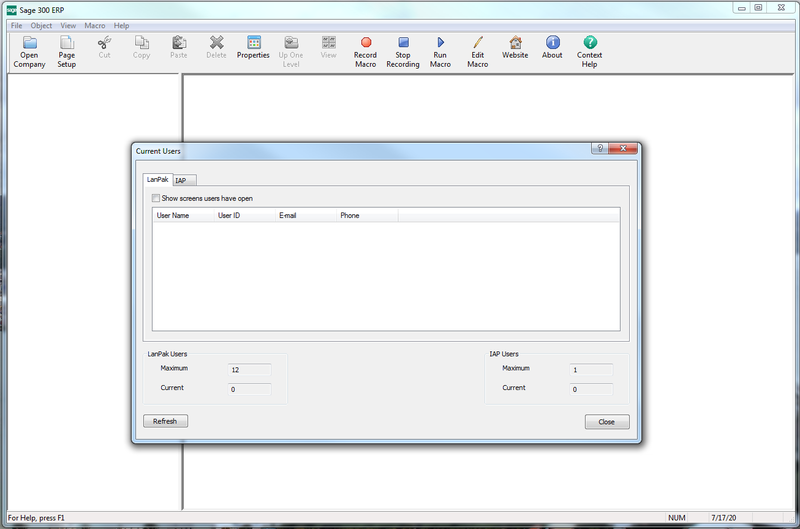 Sage CRM also doesn’t use frames to hold custom screens anymore. This will affect some ASP based customizations, but generally leads to better ability to control your own web pages (especially the CSS). The main change to the Sage 300 ERP integration was changing Quotes to Orders to work in the new frameless Sage CRM web pages. Most other changes have already been released in service packs or hotfixes for Sage 300 ERP 2012, so if you are fully current you won’t see much different. But if you are coming from an older version, you should see a number of improvements. Sage CRM 7.2 integrated with Sage 300 ERP make for a powerful front/back office solution. This release is definitely worth checking out especially for the mobility and social features. If you look in our product feedback site at https://www11.v1ideas.com/Sage300ERP/Accpac you will notice a number of items in the top ideas section to do with managing Sage 300 ERP Lanpaks. 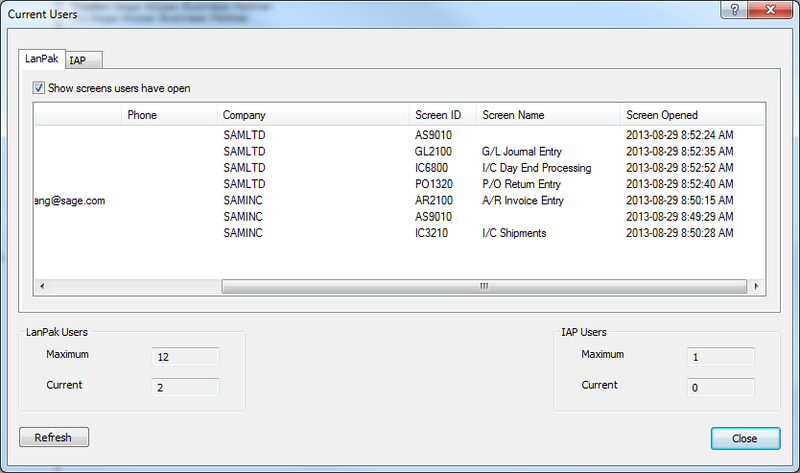 In the upcoming Sage 300 ERP 2014 release, we are adding a number of features to help with this. We’ve always had a screen accessible from the Desktop’s Help menu where you can get a list of the Lanpaks in use, and who is using them. However there was a fundamental flaw in this screen, namely that you needed to log on to the Desktop to access it and this required using a Lanpak. So if you were out of Lanpaks, you couldn’t log in and see who was doing what. Now if you run the Desktop, you can cancel the signon dialog and select Help – Current Users… This then will give you a signon dialog where you can signon specifically to see who is on the system without using a Lanpak. To demonstrate I did this on my laptop and the screenshot is below. Notice that no Lanpaks were used in bringing up this screen. So now if you are out of Lanpaks and need one, you can access this screen, see what people are doing and then ask the person doing the least important work to sign-out. Previously, all the Lanpak screen told you was which user was logged into which company, you didn’t know what they were actually doing. In fact many companies have only one company and everyone logs in as ADMIN, in which case the screen gave you no useful information. The usual suggestion here is to setup users and security properly, but for Sage 300 ERP 2014 we are giving quite a bit more useful information in our new “Current Users” screen. Now we give you the users along with their contact information. Sorry for the two screen shots, but one shows the information with the horizontal scroll bar scroll left and the next one with the scroll bar scrolled right. Further there is an option to see all the screens that they are running and the time when they started the screen. The screen AS9010 is the Desktop and will have a proper description by the time we ship. This way you can make a judgment on who you want to kick out of the system. Perhaps user1 is only running data entry screens and you know they have gone home, so you can log them off. Or perhaps user2 is running I/C Day End Processing and only started it just now, so you want to let that run to completion. Besides using this screen to manage Lanpaks once they run out, you can also use this screen to see what people are doing when the system is slow, perhaps lots of people are printing reports or posting batches. Either way you can use this to manage more cases than just Lanpaks. Managing periodic slowdowns is one case, looking for low usage times to run larger reporting or processing runs is another. 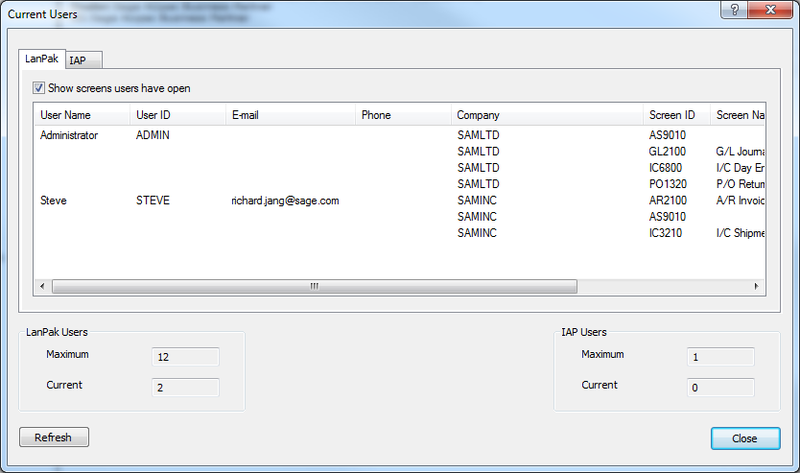 The descriptions come from the language DLL that is generated from the VB template that is part of the Sage 300 ERP SDK. This means that we will be able to display good screen names for any Sage or third party application that is written in the SDK and uses the VB UI template. We also know about a few special cases like the Desktop. For IAPs we don’t give as much information since this tends to be used by third party non-SDK applications that we don’t know about. For this version we don’t provide a mechanism to kick people out from here. We are considering this for a future version, but want to get this rights, so we don’t just kill a process while some one is entering an order and causing them to lose their work. However if you are running on Terminal Services then you can use the Terminal Services console to kick people right out of Windows from there. As I mentioned in the introduction, this feature was the direct result of input to our ideas web site. So to just stress that if there are features you want added to Sage 300 ERP, be sure to add them here. If others agree with you and it makes it to the top of the list, then it has a very good chance of being implemented. Notice that the ideas web site lists the ideas that we have implemented, ideas in progress and which are the current top rated ideas. Feel free to promote your idea on Sage City, this can help get your idea implemented with sufficient support. 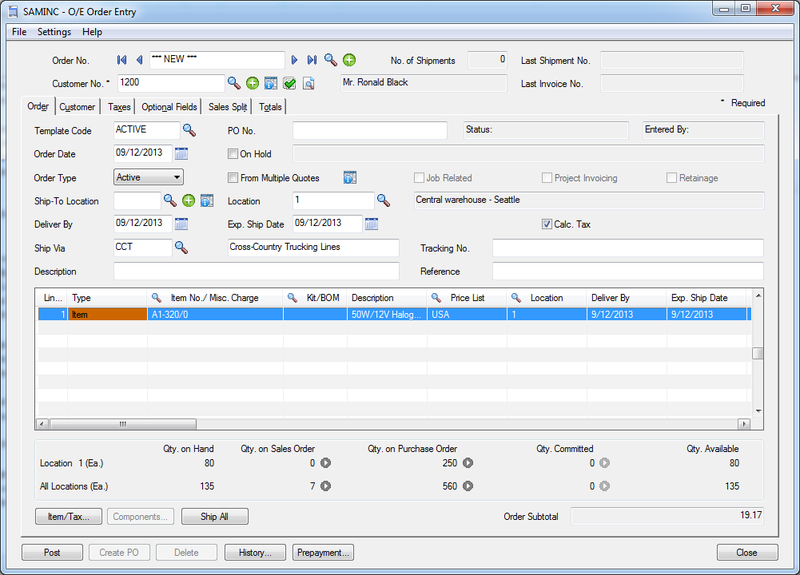 With the forthcoming Sage 300 ERP 2014 release we are giving you better methods to manage your Lanpaks. First by letting you see what is going on without using a Lanpak and then second by giving you more useful information on what people are currently doing.